Happy New Year! Did You Carve Your Turnip? Halloween. Before the Church and candy companies got ahold of it, this holiday was a celebration of a very different nature and a very different name, Samhain. Pronounced sow-in, Samhain roughly translates from the old Irish as ‘summer’s end’ and was a celebration of the end of the lighter half of the year and the beginning of the darker half thus marking a new year. For our Irish ancestors the new year, the new day which began at sundown, and new life all began in a womb of darkness. This is also a time when the veils and borders between this world and the Otherworld are thin, allowing spirits to roam freely between the worlds. While Irish family ancestors were honored and invited home, other less friendly spirits were to be avoided. For some this warding off included dressing in frightening costumes. For many it included carving heads as the head was believed to be where the soul resides and was thus considered the most powerful part of the body. This was the real reason the Irish collected heads during battle….but that’s another story altogether. Candles were placed in these carvings and these carvings were placed in windows so the light of the soul would keep the family safe. 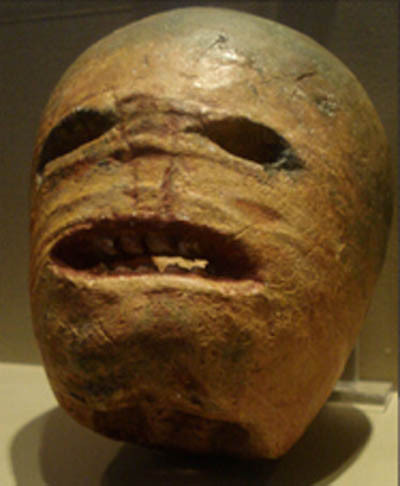 This photo is of an actual preserved Irish turnip carving. But I understand that if you haven’t got a turnip, a mangelwurzel will do.